1969-cu ildə Qazax rayonu 3 nömrəli məktəbini bitirib. 1969-1974-cü illərdə BDU-nun Mexanika-riyaziyyat fakültəsinin əyani şöbəsində təhsil alıb. 1974-1996-cı illərdə BDU-da, 1996-2015-ci illərdə Türkiyənin müxtəlif universitetlərində çalışıb. 2015-ci ildən BDU-da çalışır. Ailəlidir, 2 övladı, 4 nəvəsi var. TƏHSİLİ, ELMİ DƏRƏCƏSİ VƏ ELMİ ADLARI. 1969-1974, tələbə, Mexanika-riyaziyyat fakültəsi, BDU. 1974-1977, aspirant, Meanika-riyaziyyat fakültəsi, BDU. 1974-1985 Asistent, Bakı Dövlət Universiteti, Azərbaycan. 1985-1993 Baş müəllim, Bakı Dövlət Universiteti, Azərbaycan. 1993-1996 Dosent, Bakı Dövlət Universiteti, Azərbaycan. 1996-2007 Dosent, Kocaeli Universiteti, İzmit, Türkiyə. 2008-2015 Dosent, Kafkas Universiteti, Kars, Türkiyə. 2015 Dosent, Bakı Dövlət Universiteti, Azərbaycan. 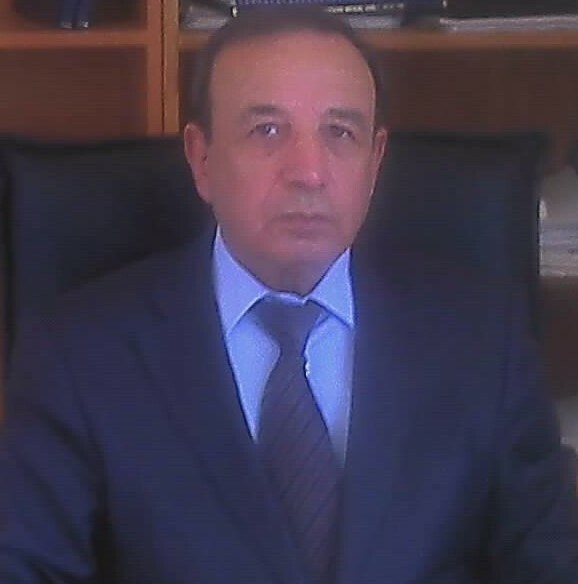 2018 Professor əvəzi, Bakı Dövlət Universiteti, Azərbaycan. 100-ə yaxın elmi məqalənin, 4 kitabın müəllifidir. Riyaziyyat üzrə 5 fəlsəfə doktoru yetişdirmişdir. K-nəzəriyyə və tətbiqi, Homotopik Nəzəriyyə, Qrup ve Modul Nəzəriyyəsi, Operatorların Index Nəzəriyyəsi, Qeyri-səlis topologiya, Soft topologiya, Cəbrdə qeyri-səlis və soft strukturlar. K-funktorun genişləndirilməsi ve onun bağlantıları. 4.cü Respublika Sempoziumu, Bakı, 1983. On the index of elleptic complexes above the C* -algebra. Baku International Topologial Conference.Abstracts. Baku, 1987. Fredholm operators and complexes above the C* -algebra. Modern problems of the analysis. All-Union Seminar, Abstracts, Baku, 1989. On the Index for the Elliptic Complexes on the C*-Algebras. Thesis of the International Topological Symposium, Baku, 1987. On the Fredholm Operators and Complexes of C*-Algebras. Thesis Union Symposium of Modern Problems of Theoric Functions. Baku, 1989. Komutativ olmayan belli bir operatorlar ailesinin indeksi haqqında. IX Ulusal Matematik Sempozyumu, ITÜ, 2-6 Eylul, 1996. Separabile and compact soft topological spaces, II International Conference of Georgian Math. Union, p.84, 2-9 September 2012, Batumi-Georgia (with C. Gunduz(Aras)). Homology theory in the category of soft topological spaces, V Annual International Conference of Georgian Math. Union, p.69, 8-12 September 2014, Batumi-Georgia (with L. Mdzinarishvili, C. Gunduz(Aras)). Inverse and direct systems of soft topological spaces, V Annual International Conference of Georgian Math. Union, p.102, 8-12 September 2014, Batumi- Georgia (with C. Gunduz(Aras), N. Demirci). Soft compact-open topology in soft mappings space, 4 International Conference, V Annual International Conference of Georgian Math. Union, p.132, 8-12 September 2014 (with T.Y. Ozturk). Singular homology theory in the category of soft topological spaces, Georg. Math. J. 22(4), 2015, 457-467 (with C. Gunduz(Aras), L. Mdzinarishvili). An introduction to ideal soft topological spaces, Second International Intuitionistic |Fuzzy Sets Conference,14-18 October 2015, Mersin-Turkey. On the Tietze extension theorem in soft topological spaces, Third International conference on analysis and applied mathematics, 07-10 September 2016, Almaty, Kazakhstan. Soft sequences in soft topological spaces, Riyaziyyatın nəzəri və tətbiqi problemləri beynəlxalq elmi konfransı, 25-26 May 2017, Sumqayıt. Separation axioms in supra soft bitopological spaces, VIII Annual international conference of the Georgian mathematical union, 4-8 September 2017, Batumi, Georgia. Soft countable topological spaces, VIII Annual international conference of the Georgian mathematical union, 4-8 September 2017, Batumi, Georgia. K-Theory on the Category of Boolean Algebras with closure Dokl. Akad. Nauk Azerbaidzhan SSR, 33 (1977) No.12. Tom-Gisin cohomology seguence of Inverse Spectra of Topological Spaces. Dokl. Akad. Nauk. Azerbaidzhan SSR, 34 (1978) No.4. Tom-Gisin homology seguence of Inverse Spectra of Topological Spaces, Dokl. Akad. Nauk. Azerbaidzhan SSR, 35 (1979) No.3. The K-Functor on the Category of Inverse Spectra of Topological Spaces. Izv. Akad. Nauk. Azerbaidzhan SSR, Ser. Fiz-Tekhn. Math. Nauk, 1979, No.2. K- theory on the category of Disributive lattices. , Dokl. Akad. Nauk. Azerbaidzhan SSR, 39 (1983) No.5. K- theory on the category of Topological Spaces. Dokl. Akad. Nauk. Azerbaidzhan SSR, 39 (1983) No.6. K-funktor on the category of Disributive lattices. Investigation of Azerbaijan University, Baku, 1983. K-funktor on the category of Topological Spaces. Investigation of Azerbaijan University, Baku, 1983. Fredholm operatorlar ve komplekslerin indeksi arasında bağlantı, 5.ci Respublika Simpoziyumu Yayınları, Bakı, 1984. The tensor product of intensity Abelian Groups. Modern Problems of Mathematic. Moscow, 1992. K- theory on the category of Boolean algebras with closure.-Amer. Math. Soc. Trans. (2), V.154, 1992. K- theory on the category of Disributive lattices. -Amer. Math. Soc. Trans. (2), V.154, 1992. K- theory on the category of Topological Spaces. -Amer. Math. Soc. Trans. (2), V.154, 1992. On the index Theory for a family of Fredholm complexes. -Amer. Math. Soc. Trans. (2), V.154, 1992. K- Functor on the category of Inverse Spectra of Topological Spaces. -Amer. Math. Soc. Trans. (2), V.154, 1992. On the index of the Fredholm complexes above the C* -algebra. -Transactions of Baku International Topological Conference. Baku, 1988. On the index of elleptic complexes above the C* -algebra, Investigation of Azerbaijan University, Baku, 1983. On the index of Family of Fredholm complexes, Investigation of Azerbaijan University, Baku, 1985. Fredholm Complexes, Investigation of Azerbaijan University, Baku, 1985. On the index theory of Fredholm complexes above the C* -algebra.-Transations of algebra and topology.Baku, 1989. The duality for Semi-Simple modulus above involutiv Rings. Investigations of Azerb. Math. Soc., 1, 1994. On the tensor product of the infinity abelian group, Modern Problems in Mathematic, Moscow, 1992. On Theory Index for a Family of Operators, Procedings of the Azerbaidzhan Math. Soc., 1996, No.2. The Fredholm Complexes with C*-Algebras “Elm”, Baku, 1991. The Fredholm Complexes on the C*-Algebra and K-Theory of the G-1-Boundles. Baku Gos. Univ., Baku, 1994. On Fuzzy Homotopy Sets, Advances in Theoretical and Applied Mathematics, Vol.1, No.3., 2006. Algebraic structures on fuzzy homotopy sets, Proceedings of the Jangjeon Mathematical Society, 9,(2006), No:2, pp.161-173. On stability of index of Fredholm complexes on the algebra, Proceedings of the Jangjeon Mathematical Society, 9,(2006), No:2, pp.151-160. On fuzzy exact homotopy sets, Southeast Asian Bulletin of Mathematics, 34, 2010, 1009-1022. Inverse and direct system in category of fuzzy modules, Fuzzy Sets, Rough Sets and Multivalued Operations and Applications, Vol. 2, 2011 No 1, 11-25. The universal coefficient theorems for fuzzy homology modules, Fuzzy Sets, Rough Sets and Multivalued Operations and Applications, Vol. 2, 2011 No 1, 41-50. Fuzzy soft modules, International Math. Forum, 6(2011) No 11, 517-527. Intuitionistic fuzzy topology on function spaces, Annals of Fuzzy Mathematics and Informatics Vol. 3, No1, 2012, 19-30. Intuitionistic fuzzy soft modules, Computers and Mathematics with Application, 62(2011), 2480-2486. Homology Theory in the category of fuzzy topological spaces, Lambert Academic Publishing, 2012. Inverse systems of fuzzy soft modules, Annals of fuzzy mathematics and informatics, Vol. 4, No 2, 2012, 349-363. Fuzzy and fuzzy soft structures in algebras, Lambert Academic Publishing, 2012.
informatics, Vol. 5, No 1, 2012, 73-85. Category of chain complexes of soft modules, International Mathematical Forum, 7 (2012), No 20, 981-992. Fredholm joint spectrum for families of operators, AIP, Proceding of International Workshop on Global Analysis., 2004 . Soft locally compact and soft paracompact spaces, Journal of Mathematics and System Science, No 2, 2013. Some results on fuzzy soft topological spaces, Hindawi Publishing Corporation, Mathematical Problems in Engineering, 2013, 1-10. The Extension of Singular Homology on the Category of Soft Topological Spaces, International Journal of Engineering and Innovative Technology, Vol. 3, No 2, 2013, 292-299. Homology Theory in the category of fuzzy topological spaces, Lambert Academic Publishing, 2012 (with C. Gunduz(Aras), T.Y. Ozturk). Inverse systems of fuzzy soft modules, Annals of fuzzy mathematics and informatics, Vol. 4, No 2, 2012, 349-363 (with C. Gunduz(Aras), M.I. Yazar). Inverse and direct systems of soft modules, Annals of fuzzy mathematics and informatics, Vol. 5, No 1, 2012, 73-85 (with C. Gunduz(Aras), T.Y. Ozturk). Category of chain complexes of soft modules, International Mathematical Forum, 7 (2012), No 20, 981-992 (with T.Y. Ozturk). Soft path connectedness on soft topological spaces, Procedings of the 2013 International Conference on Computational and Mathematical Methods in Science and Engineering, Vol.1, 239-245, Almeria-Spain (with C. Gunduz(Aras), A. Erdem). Intuitionistic fuzzy soft topological spaces, Pure and Applied Mathematics, TWMS, J. Pure and Appl. Math. (2014), V.5, No 1, 66-79 (with C. Gunduz(Aras)). Soft Mappings Space, Hindawi Publishing Corporation, The Scientific Journal, 2014, 1-8 (with T.Y. Ozturk). The extension of singular homology on the category of soft topological spaces, International Journal of Engineering and Innovative Technology, (2013), V. 3, No 2, 292-299 (with L. Mdzinarishvili, C. Gunduz(Aras)). Soft topology of function spaces, Jokull Journal, (2014), V. 64, No 10, 34-46 (with T.Y. Ozturk). A new view on soft normed spaces, International Mathematical Forum, (2014) V. 9, No 24, 1149-1159 (with M.I. Yazar, T. Bilgin, C. Gunduz(Aras)). The singular homology groups of soft topological spaces, On actual problems of mathematics and mechanics, Procedings of the International conference devoted to the 55th anniversary of the Institute of Mathematics and Mechanics, p.103-105, Baku-2014 (with L. Mdzinarishvili, C. Gunduz(Aras)). Soft topology on function spaces, On actual problems of mathematics and mechanics, Procedings of the International conference devoted to the 55th anniversary of the Institute of Mathematics and Mechanics, p.103-105, Baku-2014 (with T.Y. Ozturk). A new Approach Separability and compactness in soft topological spaces, Pure and Applied Mathematics, TWMS, J. Pure and Appl. Math. V.9, N.1, 2018, pp.82-93. Qeyri-səlis soft G-modullar, Bakı Universitetinin xəbərləri, Fizika-riyaziyyat elmləri seriyası, N1. 2018, 45-52. Soft modullar kateqoriyasında tərs limitin törəmə funktoru, Bakı Universitetinin xəbərləri, Fizika-riyaziyyat elmləri seriyası, N1. 2018, 24-34. Soft modullar kateqoriyasında universal əmsallar haqqında teoremlər, Lənkəran Dövlət Universiteti, Elmi xəbərlər, Təbiət elmləri bölməsi, N1. 2018, 12-18. Fredholm operatorlar, komplekslər ailələri ve qapanma əməliyyatlı Bool cəbrlərin K-nəzəriyyəs, Bakı 1985.